is an application that extends the functionality of suitable mobile phones so as 2 or more such mobile devices are able to communicate within a certain range without using the mobile network. Mobile Communications have become a key asset to our society, not only for individual purposes and industrial activities but especially for supporting mission-critical forces in their vital operations. Given this relevance, communications should be always available, although this is not the reality. 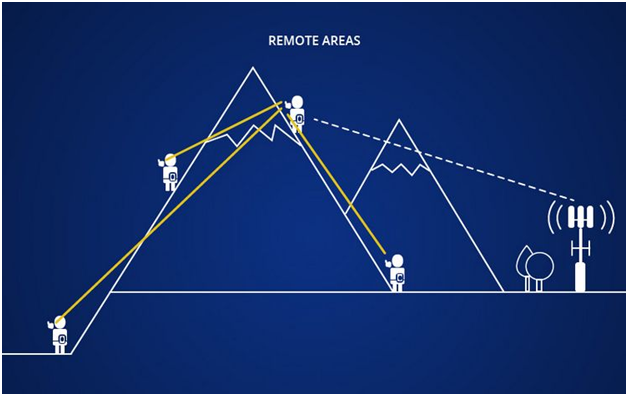 Since existing systems are based on infrastructure (repeaters, base stations, etc. ), there are many situations where they fail to provide the service, either due to their vulnerability (e.g. deliberate actions, human errors or natural disasters), the attenuation of signals (incapable to penetrate inside buildings or underground areas) or their high costs (not commercially viable in unpopulated locations). 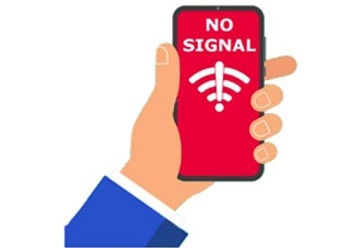 In these scenarios, the potential damage of unavailable communications ranges from simple inconveniences to enormous economic losses, personal injuries and even deaths. Is it possible to overcome these limitations? OFF-WEGO is an innovative solution for enabling voice and data mobile communications without depending on any external infrastructure (‘Off-Network’). This is possible by applying our advanced Direct Mode (DMO) concept to smartphones and other items (e.g. fireman helmets), so that users connect directly device-to-device. This way, OFF-WEGO cannot be affected by the common failures of infrastructures and thus guarantees robust communication links even in those critical situations where other systems fail to operate. 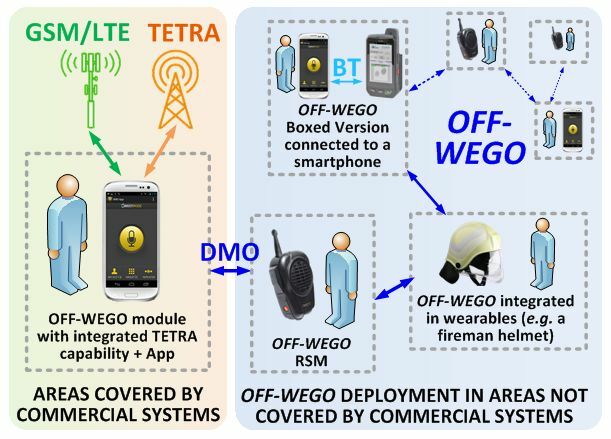 Besides, OFF-WEGO offers a complete set of features to facilitate its use and leverage its potential, like the repeater mode (to extend the coverage to unlimited distances), the gateway mode (interoperability with external networks), user groups (for customised communications) and advanced encryption techniques to protect the integrity of communications. All these features make OFF-WEGO an ideal solution for mission-critical operations, but also for enterprises’ and individuals’ activities. Total availability. 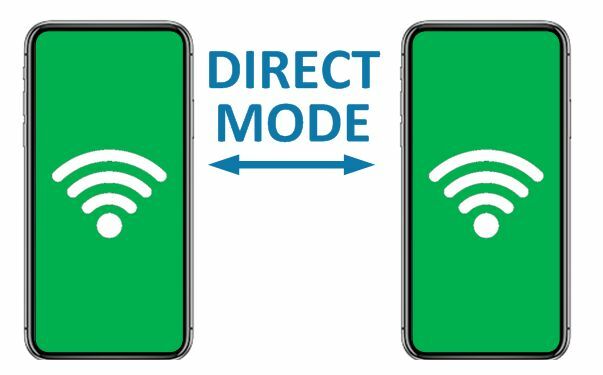 OFF-WEGO is based on Direct Mode (DMO) links, so users connect device-to-device independently of any external network (Off-Network). Combined with advanced encryption, vulnerability against common failures is minimised and the availability is guaranteed. Fast and autonomous deployment. With OFF-WEGO, wherever there are two or more users within a range of up to 5 km, there is an instantaneous link that does not need any pre-operation or infrastructure. Besides, each OFF-WEGO device acts as a repeater (mesh network), extending the service to a theoretically infinite range indoors or outdoors. 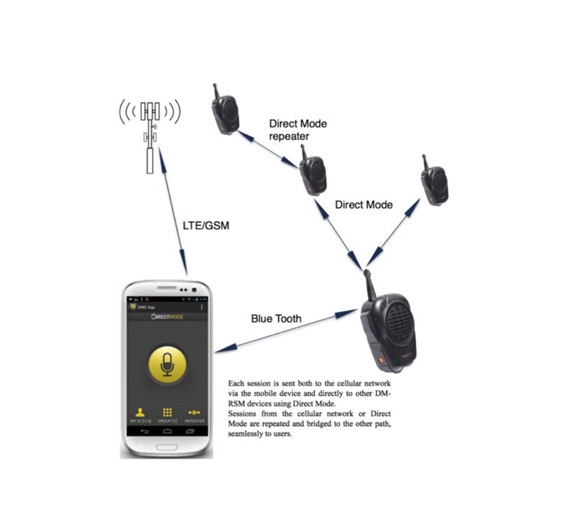 It also allows group communications (calls, SMSs, alarms…) to quickly and easily customise the system to specific aims. Interoperability. OFF-WEGO acts as a seamless gateway toward GSM/LTE and TETRA networks, and can also interact with other systems through its integration into radio devices. OFF-WEGO Remote Speaker Microphone (RSM), a proprietary device that can perform as standalone solution for voice links and/or can be connected via Bluetooth (BT) to smartphones for adding data transmission capabilities. In the latter case, the smartphone is used for data presentation and setup procedures. OFF-WEGO Boxed Version, another proprietary device, similar to the RSM but much smaller, and meant to be put into the pocket. It has no mic/speaker function, so smartphones or other BT-based devices must be used for the communication. 3rd party products like smartphones and other items (g. fireman helmets) where we integrate/attach our OFF-WEGO Modules and which we convert into cutting-edge professional radios (no need for additional communication devices). Thanks to high frequency and modulation type, DMO is very suitable for use in underground tunnels, mines etc. 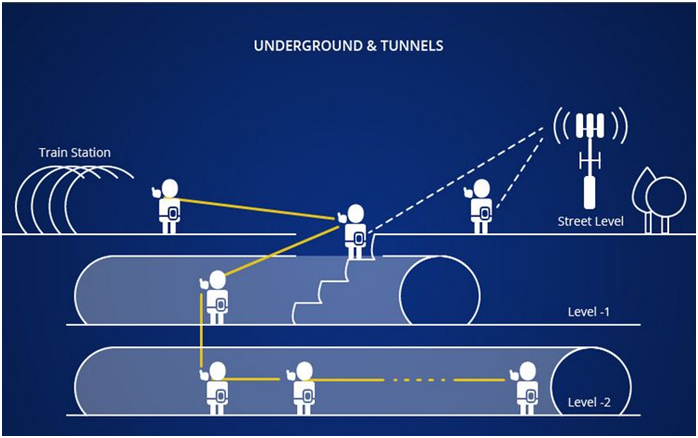 The “underground tube” acts as the waveguide and signal propagation is very good. It can be used by professionals working on construction, maintenance and similar duties in underground and also by emergency services in the area not covered by radio. 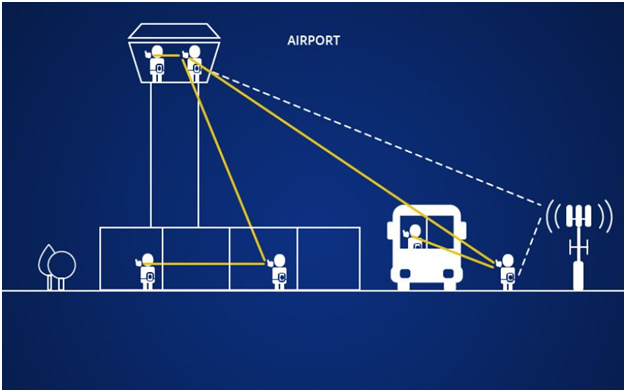 The communications between all services on an airport are big challenge due to big area including runaway, buildings and underground corridors for luggage transport, cleaning etc. DMO fits perfect due to ability to build a network everywhere. 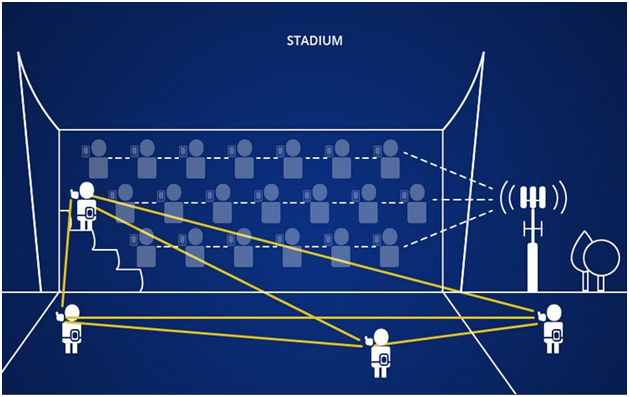 The Stadium is an example of DMO network on large area with many users like security personnel, police, entrance security, parking staff etc. Thanks to Repeater Mode DMO has excellent propagation in buildings. 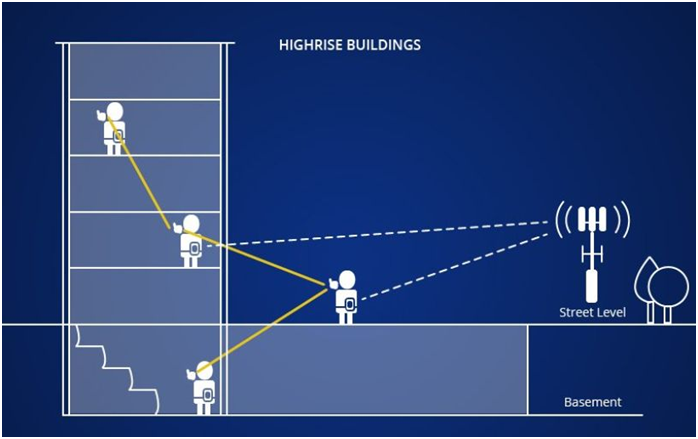 Standard professional radio rely on external repeater and cannot penetrate deep inside concrete building. 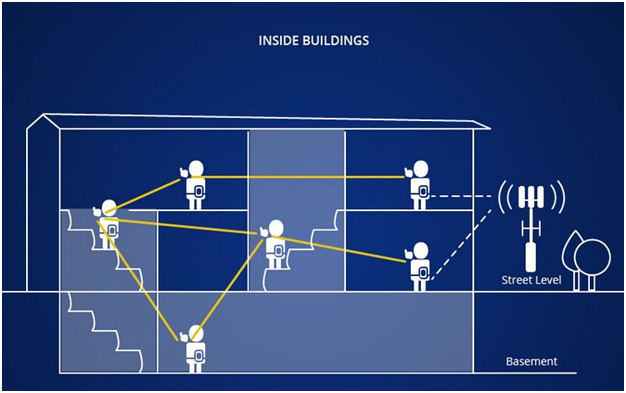 DMO MESH network solves the problem of attenuation by house construction thanks to Repeater. Typical penetration of DMO Repeater is trough 2 levels up and down in modern building with concrete/metal enforced walls.